One of the improvements to early radio was the introduction of the AC power supply. The very first amplified radios were powered by batteries—at least two. The “A” battery, used to light the filaments, was 6V, and similar to the batteries used in automobiles of the time. Although in batteries built specifically for radio use, the plates were designed for lower current over a longer time. The second, “B” battery powered the plate circuit. That is why even today the high voltage rail is referred to as “B+.” At the dawn of radio the voltage required was about 45V, so often two 22-24V batteries were needed to achieve the B+ voltage. A third battery (“C”) was some times used to provide bias. The happy high-end radio owner of the day would often have his batteries charged at the local automotive service station. Looking at Fig. 1 (a typical radio circuit of the day), you may wonder how such a circuit could work. It appears that the antenna is coupled to a tunable inductor that feeds an amplifier tube. There is no capacitor to form a resonant filter circuit. The output of the amplifier tube, which you would assume is all radio frequency (RF) energy, goes directly into the headphones. That is because this schematic is for construction purposes. The second missing factor is that the tube is not biased properly. Pencil in a resistor to show the leakage resistance across the input capacitor—this will serve as a bias resistor. It will vary a bit with temperature and humidity, but it’s always there. Some versions of the radio circuit did not even use this capacitor. The inductor was connected directly to the grid, so that it also functioned as the bias resistor. This improper (by today’s methods) bias causes the tube amplifier to work in class “C,” which is a label that wasn’t around then. Class “C” amps are very nonlinear because they conduct for only part of a cycle. This works great for this circuit because it acts as both amplifier and as a partial rectifier! Now you can pencil in a series inductor that is built into the headphones’ coils. These act as the RF choke to keep the tubes’ gain high at RF frequencies and also as a low-pass filter to smooth the distorted (rectified or pulse-width modulated!) amplitude modulated (AM) signal into audio! The headphones of the day did not use a moving voice coil. The design of choice was based upon another major invention—the telegraph. The moving part was a steel disk or armature, held in place at the center by a “U” shaped mag net, the edge of which was supported by the case a little further out than the magnet. This caused the disk to bow in slightly at the center. Two coils were wound around the magnet. The current through the head phone’s coils would cause the magnetic field to vary, moving the steel disc. The moving coil loudspeaker we know today was not well de scribed in the literature until Rice and Kellogg wrote their paper in 1925. Above: Fig. 1: A typical radio circuit. The batteries, of course, pretty much act as just a power source. The internal resistance inductance and capacitance don’t really con tribute much; everything need not be complicated. Even today, most sound systems are still operated by batteries. The ones you may prefer to play with require more power than is conveniently supplied by batteries. The introduction of the AC (alternating current) line-operated power supply in the 20s was a great convenience. A high voltage supply could be made from the household electrical service using a tube rectifier. Although of low current by today’s standards, these were a great step forward at the time. The filaments’ power supply required more current than was practical with the then available rectifier, so it was powered by a low AC voltage. This introduced hum into the audio with a directly heated cathode, so the indirect cathode heater became popular. With a well- designed radio this hum could be kept to a minimum. Most of the electricity used in the household first was devoted to incandescent lighting. As time progressed, the motor in the refrigerator and even one in the furnace added to the household load. Electric motors became the second killer “App” for the new electric service. Indus try quickly caught on to the usefulness of these remotely locatable motors. The motors had different current draw characteristics than light bulbs. In a light bulb load the current draw follows the voltage level as the sine wave voltage goes up and down. In a motor the current draw was determined to follow or lag the volt age. This was due to the inductive component of the motor’s load. This was a new problem that was not present when the only power choice was direct current. To make matters worse, the lag would vary depending on the actual load placed on the motor. This required rethinking how power use was calculated. The idea of power factor came into use. Power factor looks at the actual power consumed and compares it to the power that would be used if the peak current draw occurred at the same time as the peak of the AC waveform voltage. True power is the volt age times the current times a correction for the phase angle between the peak current and voltage. Today, refrigerators are more efficient, and people use fewer incandescent lamps. Many of the loads you place on electric service are electronic in nature. These often require direct current (DC) sources of electricity. There is a power supply inside to produce the voltage and cur rent actually needed. Some of the power supplies provide regulated voltages; others do not. Some supplies use switching regulators because they often are more efficient. Others use linear power sup plies, which are simpler and cost less. All of the DC power supplies have one thing in common: They take the AC current, rectify it, and filter it, often with a capacitor or sometimes with an inductor. Figure 2, a typical AC rectifier and capacitor power supply, uses a transformer to change the line voltage. Not all power supplies use transformers; the input to a switching supply is usually straight from the wall. The DC voltage measured from this supply is shown in Fig. 3. The diodes in the circuit act as a one-way valve. The electrons that make up the current can flow only one way. (Electron flow is actually from negative to positive, but when the idea of current flow was developed by looking at how sparks jumped, scientists concluded that current flows from the positive to the negative terminals.) By arranging the diodes properly in this manner (called a bridge), the capacitor is charged positively from both the positive and the negative excursions of the AC line. The noise that is caused by the diodes’ rectification action has been well covered before, so I won’t go into that noise source. The output of the supply first charges as the line voltage rises. The capacitor stores this energy to make it available at the output of the power supply. When the line voltage falls (thus the current is called alternating), the capacitor provides energy to the load. The voltage drops as the capacitor delivers current; there is less energy stored. That is the nature of a capacitor. The capacitor will replace this energy only when the voltage into it’s greater than the stored charge. That is why there is a downward slope at the top of the waveform’s crest. If the capacitor is charged to 140V at the peak, and the capacitor is big enough or the load small enough, it may discharge only about 5% or 7V. As a result, the capacitor won’t recharge until the supply voltage goes back above 133V. It will continue charging until the line reaches the maximum of 140V again. The line voltage will drop to zero, but again the capacitor will hold charge and keep the output above 133V. I call this a 140V supply with 7V of ripple. Others would call it a 133V supply 600 with 7V of ripple. Above: Fig. 2: Sample AC rectifier and capacitor power supply. Above: Fig. 3: Power supply voltage. It should be clear that if this power supply were putting out 1 mA at 140V, it should take in about the same total power. The problem is that it puts the current out continuously but recharges only for a small fraction of that time. To get 140mW (140V x 1mA = 140mW) into the power supply, you have only a fraction of the time available. With 7V of ripple you would have only 180 of the 180° cycle from when the voltage rises above 133V until it reaches 140V. That means that if the charging current were supplied uniformly during this time, it would need to be almost l0niA. A transformer has some hidden attributes. When the AC. 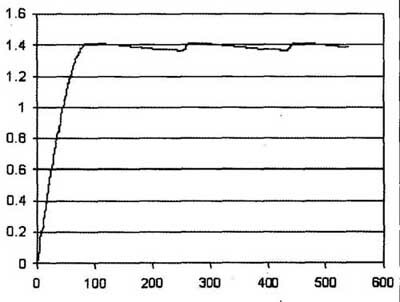 line voltage reaches a peak, the diode should have topped off the capacitor’s charge. Actually, as the load is reduced . on the transformer, its voltage rises so that it has the ability to spread out in time when the energy is delivered. There is also the hidden inductance in the transformer. As the secondary is unloaded, the inductance will cause the output voltage to rise until the energy stored in the inductance can be discharged. There is also some hid den capacitance in the windings that has energy stored, but to a lesser extent. All of these characteristics help to reduce the harmonic content returned to the AC power lines. The spectrum in Fig. 4 is of the cur rent drawn from the AC line by a simple diode bridge power supply. 110m corresponds to one amp of current: Here notice that the second harmonic is sup pressed a bit by the balanced nature of a bridge. The third harmonic is almost the same amplitude as the first! The band width limitations of the transformer reduce the higher harmonics. Now you must consider another unseen component. The power lines from the power station to your home have some resistance. In order to be efficient, this resistance is made as low as is cost effective! Some loss is tolerated because the cost for no loss would become excessive. Resistance is measured in ohms, so you use the letter “R” to stand for it. Of course, when you talk about the AC value, you use “Z.” Many people use the letter “V” or “v” to stand for volt age measured in volts, so, of course, I use the traditional “E,” which stands for electromotive force. The classic equation for direct current is I x R = E, and for alternating current it’s i x z = e. To completely confuse the non-initiated, you use j, not i, for the square root of negative one! For the second problem, consider that all the power supplies for everything from lights to computers are drawing current just at the voltage peaks, greatly increasing the current draw on the utility lines at that time (or for a limited phase angle). I could do some very fancy math to calculate the current draw over the time integral for the Fourier series that represents the power, but you can get close enough just using Ohm’s law. The peak current times the equivalent line resistance is equal to the voltage sag. Above: Fig. 4: Spectrum of the current drawn from the AC line by a simple diode bridge power supply. Figure 5 is the actual current drawn from an AC line. As notice, almost all the current draw is entirely at the peak of the AC voltage. The current draw does not smoothly follow the voltage. Above: Fig. 5: Actual current drawn from an AC line. This is a nonlinear load, which causes a flattening of the voltage and is a form of harmonic distortion. This is why the load generates additional energy at multiples of the 60Hz fundamental. Profession al engineers who design power systems aim for less than 5% distortion in the AC voltage waveform from this cause. It may be just coincidence, but many power distribution transformers have 5% adjustment taps to get the final voltage very close to what is required. When you measure the AC line, you must understand what you are measuring. My simplest meters use a diode to rectify the AC to DC, a resistor to change the voltage to a current, and a meter to show what the current actually is. The scale is then calibrated to show the root mean squared (RMS) voltage level for a clean sine wave. The RIVIS value of the AC line is the measurement of preference for determining the heating ability of an AC source when com pared to a DC source. Ten volts RMS AC will provide the same heat (or total energy) from a given load resistance as 10VDC. Some meters—true RMS meters—actually do the math on the AC waveform to determine the real RMS value. Others—such as my simple meters—assume a clean sine wave and are called “Peak Reading RMS Indicating” (PRRI). If your meter does not proclaim loudly it’s a “true RMS” meter, it’s almost certainly a PRRI meter. On my distorted AC power line the RIVIS meter will read 120V, while the simpler meter will read 118V. Both are right! The power is there for a heater or motor, but the peak voltage is clipped. An amp that is rated for 100W at 8Q should have DC rails inside of at least 40V. If the amp was intended to operate from an AC line voltage of 120V and you have 120V RMS with 5% flattening of the peak or top of the AC waveform, then the amp rails could actually drop to 38V. This would reduce your output power to 90W! A third source of noise occurs when a load is switched on or off the line. This causes a dip or spike in the volt age. Although this is momentary, a large load switching off in combination with the inductance of the line and load can cause a voltage spike large enough to damage other equipment connected to the line. The current or energy that was flowing through the inductor must find a place to go. The voltage across the inductor will continue to rise until the energy finds a new home. If the current and inductance are large and the only load on the line is your brand new Wowsa Mark Seven amplifier, there is no contest. Start shopping for a price on a new Mark Eight! This problem also occurs on a smaller scale—a universal motor will put noise on the power line. Watch for the sparks on the commutator of a router or other power tool in use, indicating a noise source, which can put out energy in to the tens or even hundreds of megahertz range! Sometimes you may deliberately put noise on your own power lines, with a number of devices from intercoms to light switches that use the domestic power system to carry radio signals for short-range purposes. Of course, there are also radio, television, and other transmitters that will send some of their signals into power lines. If you are close to a 50kW transmitter, how much energy do you pick up? Do you really think all the energy from your microwave oven stays in the box? Lightning strikes also cause spikes, and they behave differently depending on your power company! My power company places one of the “hot” AC lines on the top of the wire run; others use the ‘neutral,” which is in tended to be grounded at the building point of en trance so that any lightning surges should be reduced or removed. Great idea, but if the building ground is defective, the protection you were counting on is now a defector to the side of Thor’s flash and boom. When the hot lead is on top, sometimes you will see a lightning strike destroy some gear and leave others untouched. This could be a mystery if we didn’t know the reason. The energy in a lightning strike is tremendous. If one hits your power wiring, severe damage will occur. If the lightning only strikes close to you or your power lines, then protection will help. One of my bits of engineering philosophy is that an engineer takes a vaguely defined problem, first defines it, researches, redefines it, and finally comes up with the solution(s). A technician can take a well-defined problem and build a gizmo. Now that you have a handle on what we get from our AC supply and perhaps some idea of what you want, you have solved the first step in the engineering problem. The simple goal is to look at how to reduce enough of the noise to remove any consequential concerns (another vaguely defined problem!) and return the peak voltage back to what it should be. The most dangerous noise is, of course, the abrupt voltage spike caused by a load being removed from the line or part of a lightning strike. So you need a spike eliminator or surge suppressor. The first step a prudent designer takes is to look at what is already made for this purpose! Digi-Key’s catalog lists about 60 pages of Circuit protection components. So now you need to narrow that down to a few good choices. The open question is how high the voltage spike could go. Here I will be tricky. The normal insulation voltage rating for wire is 600V P.MS AC. This is 850V peak. Because there are two wires carrying the spike, the insulation must withstand at least 1700V. I will multiply this by 1.67, which is a fairly normal safety factor for other engineering designs. My experience suggests that 2800V may break over in nor mal wiring, but 1700V will not. I also expect this spike to be at least partially reduced by the regular AC waveform inversion. So the spike should begin to be reduced in one half of the 60Hz waveform. So you can now design for a reasonable worst case of 8ms of a 2800V spike into a 300m-Ohm load delivered to my outlet. If the house has a history of power-line lightning strikes or other service problems, I would place a larger surge protector at the household electrical service point of entry to protect the entire house. I selected a metal oxide varistor (MOV) that has an 8ms rating of 10,000A. This is a standard item about 1” in diameter and 1/8” thick. They are also available in smaller sizes. My educated guesses about the worst case surge nicely coincided with the size of parts that are available—a handy double-check! I need to know a bit about the MOV before I hook it up to my AC line. The metal oxide in the name tells me what it’s made of. The varistor means that it’s a resistor whose value varies. It’s a higher value of resistance until the voltage goes above a certain voltage and then the resistance drops. I will need to select the right voltage for my application or it will be just a short across the line. Note also that because it’s a nonlinear load it will produce some harmonics in the AC voltage all by itself. A good choice is Digi-Key part #495- 1444. It costs less than $1 and has a 140V rating, which means it won’t begin to protect at my normal high line voltage design value of 132V. It should limit a spike to 360V. This may dam age some equipment, but I will follow this device with a bit more protection circuitry. The MOV dissipates some energy, even when not protecting. My arithmetic tells me this should be less than 10mW. A second bad habit is that if the MOV fails it can go to a low resistance mode. In drastic terms it will be a short circuit directly across the AC line. In the worst case the MOV can catch fire while sinking a mondo spike. It’s a good idea to make sure it’s surrounded by metal and nothing else flammable for an inch or two around it. Of course, after it burns up it will be an open circuit and no longer provide protection. It seems prudent to provide a fuse before the MOV in the circuit. Use a 5-8A time delay fuse here to protect the power line cleaner and be reason ably sure the fuse will blow before the building’s circuit breaker does. Fuses are easily available and meet most safety standards. If you wanted to use a higher current fuse and be sure to meet all of the standards, you should use a “midget” size fuse, not the smaller common 3AG style. One of the characteristics to consider is not just the carry current but the interrupt current. If the gap that opens when the circuit protection activates is too small, the electric current can just arc over and continue with only a small voltage drop. That is why properly sized fuses are often preferred over circuit breakers—not because of cost, but the standoff current and sometimes the speed of action. A switch on the input line is a nice idea, allowing you to disconnect the circuit if you are going away for a few days. I have selected a switch from Digi-Key that is rated for more current than expected. A smaller switch could weld itself closed. The slightly tamed AC line can now go through a filter to remove the highest frequency noise. In the old days this was often a simple 100nF capacitor from the AC line to the chassis. This had the bad habit of being a low current voltage divider and putting hum into the circuit. A second problem was that some times the capacitor would short and put the entire line voltage on the chassis. This was a bad idea that only occasion ally surfaces anymore. Of course, from the technical side it only treated interference coming in on one side of the AC line. I have discussed many of the sources of noise. For removing them it’s important to note that some of them such as the harmonic generators are effectively unbalanced because one side of the AC supply called the neutral is ground ed. Other forms such as transmitter or higher-frequency sources come in on both wires because the inductance to ground is high enough the neutral behaves as though it’s not grounded. This noise is called common mode noise. A better method than just a bypass capacitor is to use an LC circuit to form a simple filter. A common mode RF choke with line-to-line capacitors works even better. Imagine this as a transformer for interference that takes the high- frequency noise on one wire, inverts it, and then applies this correction to the other wire coming in. In addition there is some inductance in the transformer that, combined with capacitance, will form a low-pass filter. The more inductance in the choke, the better the filter action will be. The downside is that the greater inductance also loses more of the desired 60Hz AC line voltage. Sometimes very small value high surge voltage capacitors also tie to the chassis. There are many safety issues here, so I will go with a premade rated filter. I picked Digi-Key #364-1019 or 364-1020 filters because they filter both types of noise conduction. It’s not the highest attenuation filter type, but has some capacitance from the AC lines to the case or ground. It’s rated for a high impedance RF load, which is what we have for most of our audio devices. Because I am following it with more devices, it should do what I need here. One is rated for 10A and the other 20A. The lower current rating offers more filtering but has a slightly higher loss. I could put a second smaller MOV across the output of the filter to knock down any remaining surges, but with the low cost I will use the same type as before. The filter in front of this protector will slow down any fast spikes that may have gotten away from the first one. In addition, I will be using other parts after this stage ( Fig. 6). 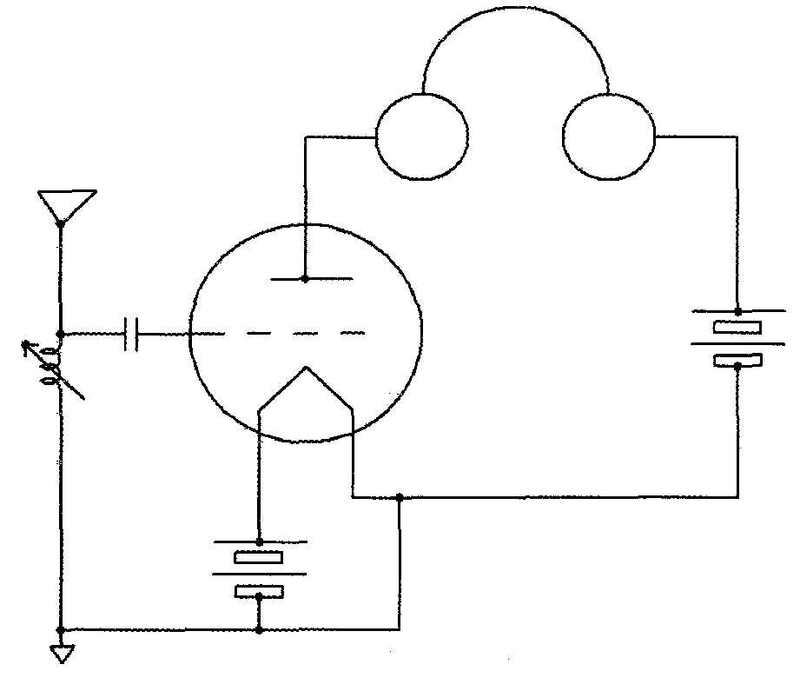 FIGURE 6: LC filter circuit. The next component is a transformer to correct for the voltage peak or even the filter losses. There are two ways to do this. The inexpensive method is to use a boost transformer to bring the peak AC voltage back up. A simple 6V, 5A or 10A transformer would do this. The primary is connected across the line. The trick is that the secondary is then connected in series with the same line. This will either step up the voltage if the windings are phased correctly or step it down if they are wired backwards. If the voltage goes down, reverse the connections on the primary. You could put in a switch to try it both ways. Some folks find their gear sounds better on lower voltages! In the first design I have included a switch to set the transformers’ primary to either 120 or 240V. Note that the double-pole double-throw (DPDT) switch is wired so that there cannot be a short across the incoming line even if the switch does not open one side before closing the other. This switch would give either a 3 or 6V boost. The 6V boost should not do any damage to the equipment being powered by this power line booster, but for the faint of heart the 3V position should be a better match for just compensating for peak distortion. I have selected a transformer with a 6.3A current rating. Using a 6.25A slow blow fuse will give a power capacity of 750W. This technique does not greatly reduce the distortion of the waveform. The inductance of the secondary winding filters some of the low-frequency harmonics. If any of the single line high-frequency interferences have made it this far, they will stop here. This transformer in the circuit actually increases the RMS value of the voltage delivered to the load. Note that the flattening of the 60Hz AC waveform is not always a problem! When the voltage spends more time at the peak voltage than on a pure sine wave, there is more time for the power supply capacitors to charge! So stepping up the RMS voltage but leaving the peak voltage the same has many benefits. The rails will be where they should be and the diodes will run a bit cooler. This booster circuit is most useful for the AC feed to power amplifiers because they are the most susceptible to low line voltage. If you are using a class A, AB, or another efficient audio amp, it could power an amp with an output wattage rating of up to 2000W! This circuit would have trouble powering a true Class A amp with an output of 200W or more. You will probably notice the improvement this gives you not just on the bottom end, but also cleaner highs. 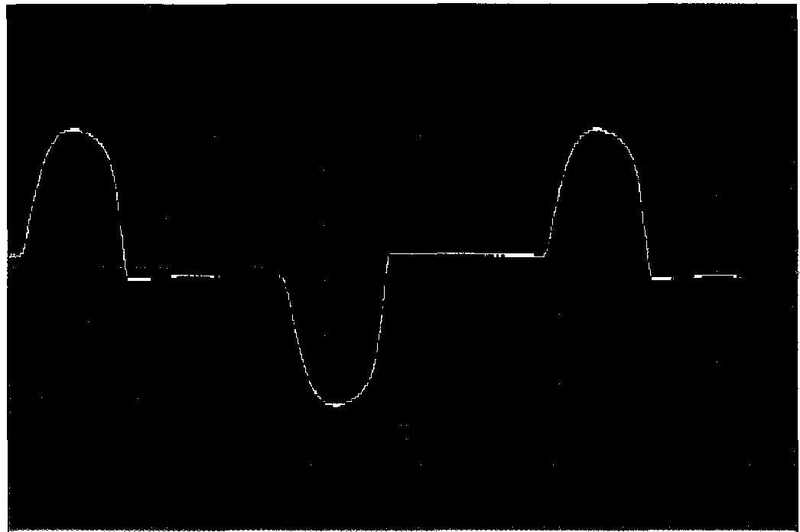 You could add a filter to the circuit to clean up the 60Hz waveform. That is where I will begin next in part 2.